Earth is a complex and mysterious planet. Its origin and purpose is not truly known. What we do know is that human civilization has to depend on the Earth for survival. The human being has been living off the Earth ever since the beginning of man’s first breath. The Earth is designed to provide all the vital nutrients animals need to live by. However, due to the development of industrial factors and processed food, the vital nutrients of Earth are being compromised. Illness, organ disease, cancer, psychological disorders, and obesity are growing in astronomical proportions. All of these situations are a direct result of poor nutrition, processed foods, and the depletion of the Earth’s vital nutrient supply. 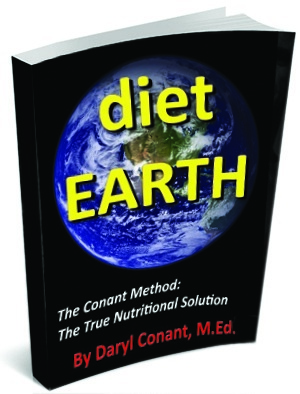 Diet Earth is a revolutionary change in the thinking of human nutrition. Daryl Conant teaches methods in how to eat, when to eat, why we need to eat and how important it is to eat raw nutrient rich organic foods.